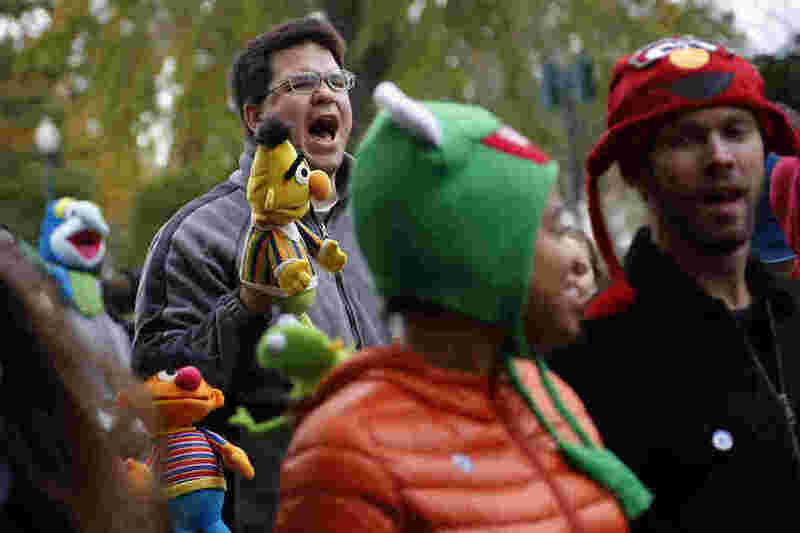 A demonstrator with a puppet of Bert, the Muppet character from Sesame Street, shouts during The Million Muppet March in Washington, D.C., on Saturday. 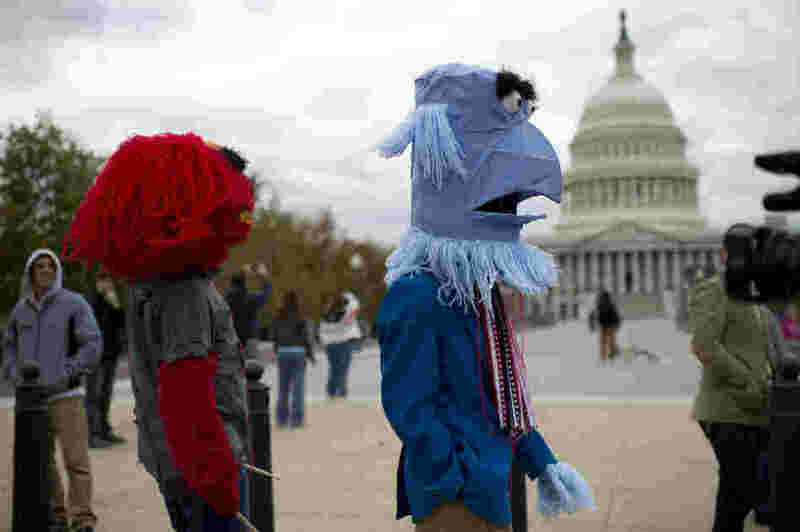 The bipartisan rally was organized to show support for public broadcasting following Republican presidential candidate Mitt Romney's pledge to cut funding to PBS. Organizers say at least 600 people signed up to attend the march, with a few thousand more participating virtually on Facebook, Twitter and in their own marches around the country. 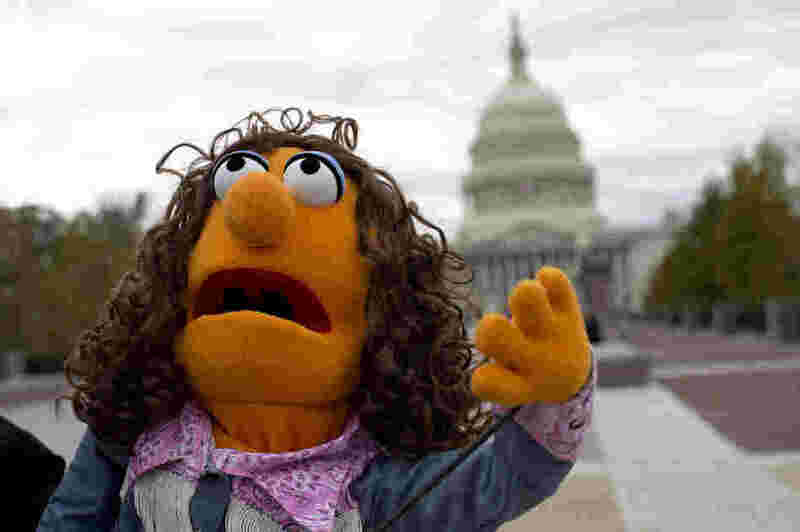 Laura Gentry holds a puppet as she shows her support for public broadcasting near the U.S. Capitol. In the first presidential debate, Mitt Romney said he loved Big Bird, but as president he would cut funding for public broadcasting as a way to reduce the deficit. 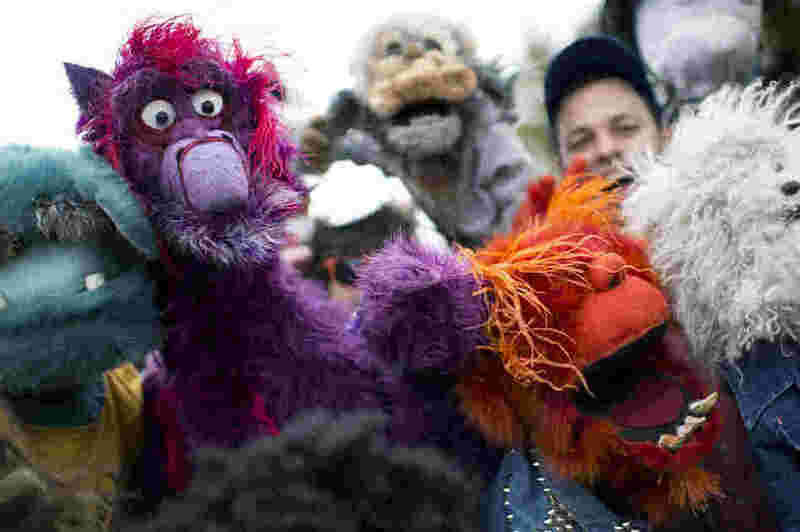 PBS supporters take part in the Million Puppet March, which featured entertainment from puppeteers, music and remarks from supporters around the country. Organizers said they hope the event will increase awareness of the importance of continued funding for public television and radio. There's presidential politics and then there's puppet politics. You may recall that in the first presidential debate GOP contender Mitt Romney made a statement that caused the two worlds to collide. "I am going to stop the subsidy to PBS. I'm going to stop other things. I like PBS. I love Big Bird. I actually like you, too," Romney said, referring to moderator Jim Lehrer. "But I'm not going to keep on spending money on things to borrow money from China to pay for it." 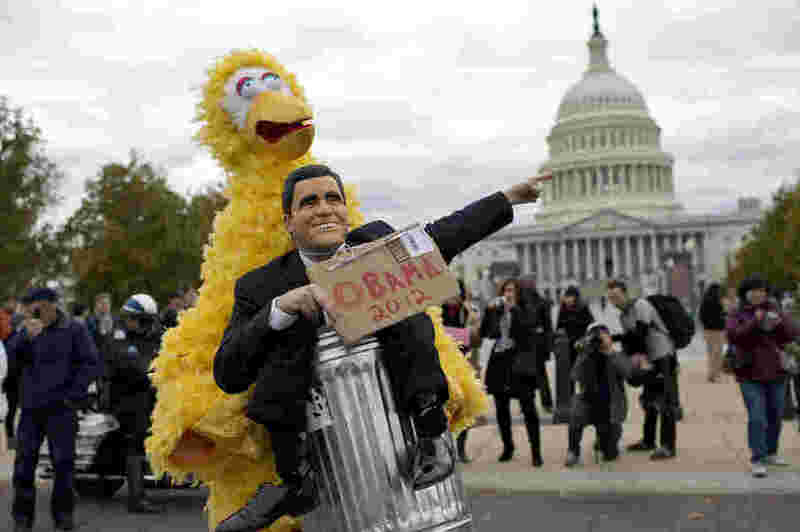 Well, that brought forth a maelstrom of venom from those who love Big Bird and public broadcasting as a whole. There were seemingly endless memes of Big Bird, like this one or this one; more than 20,000-plus tweets; and the media debate over whether eliminating funding for the Corporation for Public Broadcasting would even make a dent in the federal deficit. 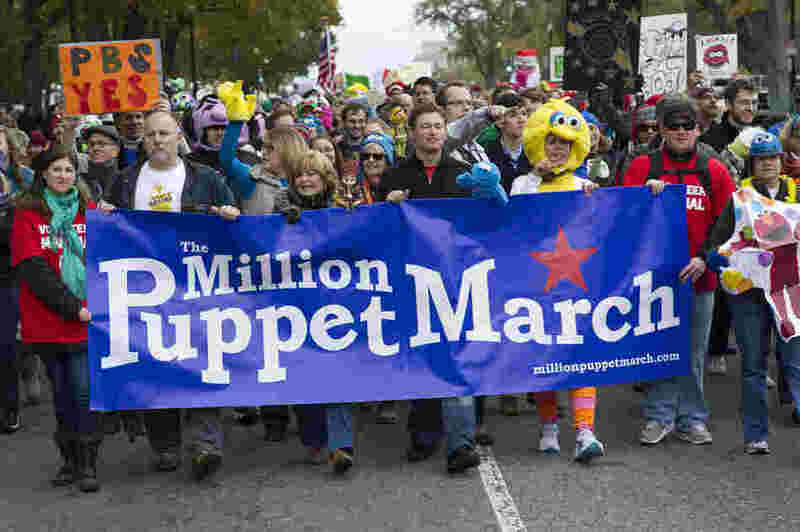 And then there emerged a movement to take a physical stand: The Million Puppet March on Washington, D.C., which is happening today at the Capitol. Organizers say at least 600 people signed up to attend the march in person, with a few thousand more participating virtually on Facebook, Twitter and their own marches around the country. So far, the pictures on the group's Facebook page show the marchers bundled in puppet-like hats with animal ears, carrying coffee, placards with statements like "Grouches of the World, Unite!" and, yes, more than a few puppets. Despite the abundance of other news around the nation, the protest's organizers are still hopeful that their efforts will increase awareness of the importance of federal funding for public television and public radio.